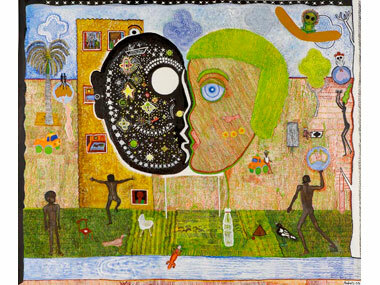 Other side art is the first museum survey of the work of South Australian indigenous artist, Trevor Nickolls, known as “the father of urban aboriginal art” (Brenda Croft, former senior curator of Aboriginal and Torres Strait Islander art at the National Gallery of Australia ). Spanning Nickolls’ work over a thirty-five period, the survey tracks the social history of Australia using the artist’s visual vocabulary, his own iconic language that has influenced and informed subsequent indigenous artists’ practice. Nickoll’s unique vision set the direction for a generation of urban indigenous artists. The survey includes more than 55 paintings and works on paper, brought together for the first time from public and private collections across Australia. The works will be exhibited across three gallery spaces at the Potter, with labels and interpretative panels and an extensive room brochure. The exhibition has been curated by Michael O’Ferrall, a senior independent consultant and curator who has worked with Trevor Nickolls for over three decades, including as the curator of the official Australian Pavilion at the 1990 Venice Biennale, which presented Nickolls’s work alongside Kimberley artist Rover Thomas. 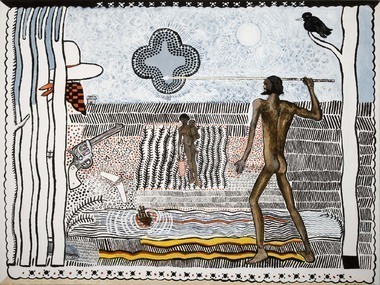 Nickolls’s works are widely recognised for their ‘dreamtime/machinetime’ theme, which combines the sheer natural wonder of the Aboriginal land and Dreamtime stories with robust symbols of urban Australia, and has become an enduring leitmotiv for the dichotomy of European and Aboriginal histories in Australia. His drawings and paintings reflect his personal experience as a Nunga man and his relationship to land, place and history. These relationships are of universal relevance. They make accessible ideas about nature vs nurture, the psychological and physical self, black and white, ‘insider’ and ‘outsider’ that inform our experience of contemporary life. Director of the Ian Potter Museum of Art, Chris McAuliffe, says the exhibition, accompanying publications and programs will establish for new audiences a strong sense of Aboriginal cultural history and socio-political experience. “It will connect contemporary artists to a tradition of endeavor and experiment. The project will have a substantial impact on younger artists, who, in experiencing survey exhibitions, discover role models and see at first-hand the meaning of commitment, longevity and personal vision”, McAuliffe said. The exhibition will tour nationally under management by NETS Victoria and with support from ‘Visions of Australia’, an Australian Government program which supports touring exhibitions with funding assistance to develop and tour Australian cultural material across Australia. 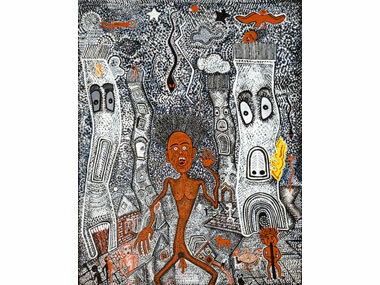 A book on Trevor Nickolls work will be published by Melbourne University Publishing.